Bookbinding Etsy Street Team: What Brush is Best for Glue? By special request, we'll be taking a look at brushes for use with glue this week. It seems a natural progression from the last topic, so here we go! To be honest, I knew nothing about brushes for applying glue in bookbinding prior to researching this topic. I've been using a cheap little flat brush which has served me well. But now that I know there are other options available I'd like to try some of them out. 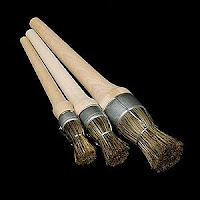 Brush Bookbinder's Round 1.5 inches - Traditional round bristle bookbinding brush. Natural hog bristles with aluminum ring reinforced and long narrow handles. 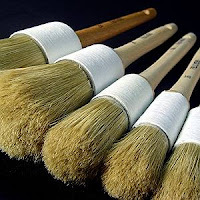 Brushes hold a large amount of glue. Shepherds Superior Brush - Archival Paste Brush. No metal parts, reduces contamination. String ferrules. Very Durable and suitable for all adhesives. Clean with warm water after use. Comes in sizes ranging from 2-28. Standard Glue Brush - With grey bristle and a plain wood handle. The brush head itself is bound with wire or 'bridled' to give a greater attack when gluing. These must be cleaned properly after use as the metal parts can start to rust which in turn can lead to contamination of your glue. Comes in small, med, large sizes. The Paper Studio - Sells both flat and round brushes. If you have a great brush supplier you'd like to suggest, please let us know by adding a comment. Opinions welcome! Thanks for putting this together Beth! I have a cheap flat brush right now. I've never had a REAL glue brush, but now I want one. I have a round glue brush like the archival paste brush up there and I use it for wheatpaste, but for PVA I use a one inch wide flat brush, which I think is good for tight areas - I have noticed that it's starting to glue itself together though. I'm not a member of BEST--yet, so I hope it's ok to comment. I've tried other glue brushes with metal and the bristles always fall out. The first brush is my favorite! Right now I use a flat fan brush. One of the ladies in my book arts group uses one and it inspired me to get one. They work well if you have a really full brush, if not it will separate into sections when gluing and you will have spots with no glue on the paper. I've always wanted a "real" glue brush but never knew enough about one to justify ordering one as they aren't available locally. I'll have to see if I can find a stenciling brush meredeth, having the glue in the middle sounds like a a big help when working with a large sheet! How is it that technical topics bring me out of the woodwork? Flat bristle brushes of various sizes depending on the size of the job. I like flat because of the precision of a sharp edged brush, and it still covers real estate when needed. I did use the round glue brushes in school, which are useful when covering large areas. Most of my work is smaller, so I haven't really needed to find a specialty glue brush. Don't ever overlook Talas when looking for equipment and supplies. Chinese calligraphy brushes are hands down the best for detail work with glue. Choose one with hog's hair if you have a choice. They wash the best and last the longest. In general for larger brushes I use hog's hair brushes for glue after lots of trial and error for years. My hog's hair brushes last for years -- they really wash the best, especially when you use brush cleaner with water. an old tooth brush works fine.. I always have a "new" :D one and I don't have to bother any hogs, or with brush cleaners. Soap & water can handle the glue. I save nice REAL brushes for painting :) Oh, I'm 2BeUva at Etsy.com, hi all. I just found this post (and only four years too late!) but I thought I'd add something. I went to the North Bennet Street School's bookbinding program in 2002-2003, and we used Anza brand round brushes. I believe our instructor Mark Andersson discovered them when he was working in Sweden and brought the idea back with him. They're a little hard to get in the US, but I really love them. They're made for professional painters, so they take a real beating. The ones used were Anza Elite Round brushes. I should track down some more of them. They really are pretty awesome.